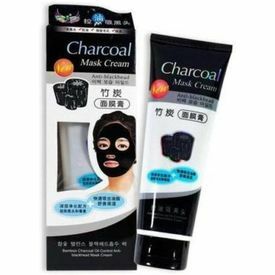 NEW BAMBOO CHARCOAL MASK CREAM - MASK ANTI CHARCOAL Blackhead. Charcoal Mask is derived from natural ingredients - to remove the oil on the face - Cleaning and removed all the dirt and dead skin cells - Lifting blackheads and tightens pores, removes acne - Make a face to be clean and brighten the skin of the face - suitable for all skin types including sensitive skin. How to Use: 1. Wash your face beforehand as usual 2. Apply the mask on the face, especially the desideratum as nose or mouth region BYK blackhead and whitehead (Avoid the area around the eyes, eyebrows and lips) 3. Leave on for approximately 20-25 minutes until the mask feels dry 4. Remove the mask gently from the bottom towards the top face. You can see the blackhead and whitehead inherent in mask 5. Clean your face with cold water to close the pores are closed perfectly instructions. Ingredients: Water, Polyvinyl Alcohol, Bamboo Charcoal, Hyaluronic Acid, Glycyrrhizic Acid, Carbomer, Triethanolamine, Tocopherol, Butanediol, Fragrance, etc.